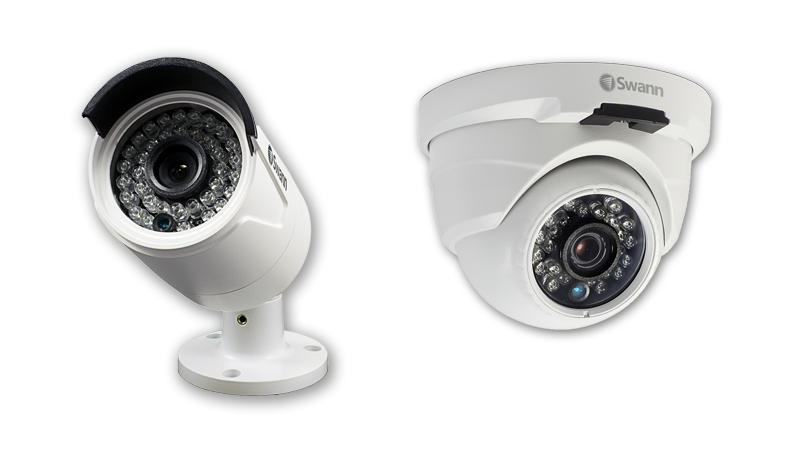 As far as camera functionality is concerned, bullet and dome cameras are extremely similar. So really what you’re looking for is what will fit best with your particular application and what your preferences are. Bullet cameras protrude outward, sort of like the barrel of a gun, where dome cameras have that circular “dome” shape. I’m sure you’ve seen both types of surveillance cameras as both are quite popular. If you are looking for an indoor camera, dome cameras are far more common. They are less intrusive, and most people agree they are far more elegant and sleek, and will flow more seamlessly with the décor of the household or building. Bullet cameras are great for outdoors because they are usually weatherproof (make sure you check the IP Ratings of the camera to discover its environmental protection). And, as mentioned above, they have a longer range, which is more necessary when viewing a parking lot or other large area. If you are looking to discourage theft or vandalism, then a bullet camera might be the appropriate choice, as they are a bit more obvious and visible to passers-by. Dome cameras are more difficult to spot, so if you’re in need of something more covert in nature then go with a dome. Not only do they not stick out as much as bullets, but the dome housing will hide where the camera itself is pointing (the field of view), and therefore what you are capturing. Bullets are usually easier to mount and install than domes, as they are point-and-shoot. Attach them to the wall and they are good to go. Dome cameras aren’t necessarily more difficult to mount, but are more likely to require dismounting to adjust the direction. This is something to keep in mind. Dome cameras win the durability test by a landslide, at least the ones that are referred to as “vandal proof”. Vandal proof domes are housed in durable enclosures made to withstand anything from shaking to vandalism, which is something to consider if yours is an application where the camera is easily accessible, such as a low ceiling. Conversely, bullet cameras can easily be damaged or knocked out of position with a rock or stick. As mentioned above, dome cameras are more likely to fit with your current décor. The dome-shape makes them more elegant and less intrusive than bullets. The overall aesthetics make domes a popular surveillance solution.